Theresa DeRienzo (SoccerND75@aol.com) writes: "I am a freshman music major at South Dakota State University. I have marched soprano at Blue Stars since 2001. This summer will be my third summer with the Blue Stars. 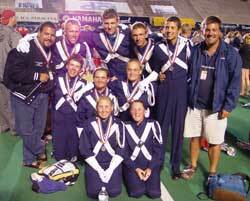 This picture was taken at DCI finals in 2002 in Madison, Wis., and it's the soprano line for the 2002 year. "Pictured here starting top left: Ray Vasquez (caption head, of Minnesota), Al Rendak (Illinois), Cameron Seip (Minnesota), Jared Krogmann (Iowa), Tyler Anthony (Minnesota), Jeff Apple (brass tech, of Indiana); Second row, Eric House (Minnesota), Dani Sexton (Indiana), me (Minnesota); Bottom row, Lea Quiram (Minnesota), Alana Fredrickson (Minnesota). "It was a great year and we had such a blast -- finals night was filled with joy. The best memory we had was when we got the relax after our finals performance and the whole corps let out a unison yell and all started crying and hugging because it was the best show ever. Thanks for a great summer!" Thanks Theresa! View the Forzato archives E-mail your Forzato submissions to dave@dci.org along with where and when the photo was taken, and send some biographical information about yourself as well. We'll give you full credit. Also, let us know if you want your e-mail address included, to get feedback from other drum corps fans.